One of the major tenets of anthropology, which separates us from the rest of the social science pack, is the holistic approach we take to answering questions. Using photography and other forms of visual documentation provide an additional venue for capturing more of the whole picture. I recently worked on a project that used photography to conduct a plate waste study in two middle school cafeterias. The goal of this project was to increase student selection and consumption of fruit and vegetable side items during the lunch period. 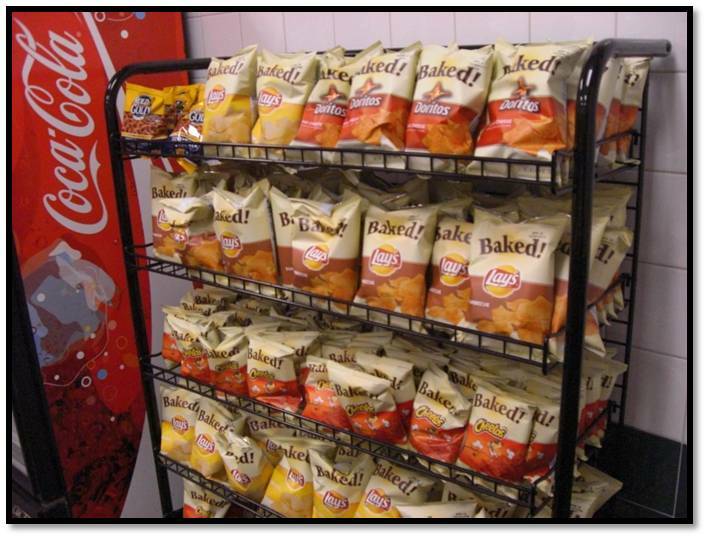 After a period of observation the research team implemented five subtle changes to the way these side items were served and presented to increase their availability and accessibility. 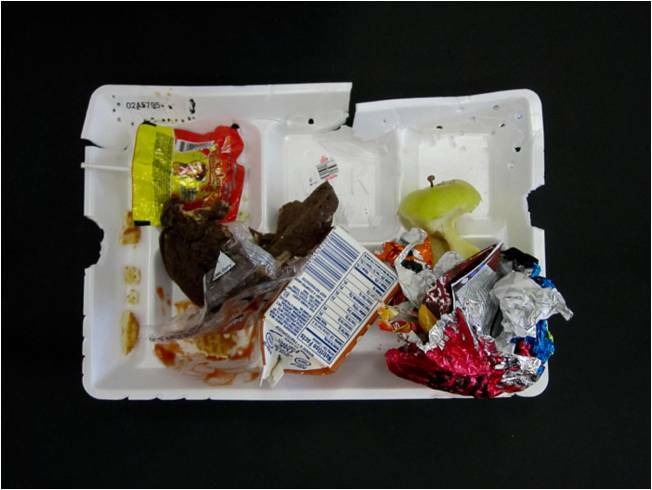 Recognizing that just because a student puts a food item on their tray does not necessarily mean that they will eat any of it, the project included a plate waste study to document both what student put on their trays and what was leftover. Each cafeteria had three food lines and served between 160-200 students during each lunch period. 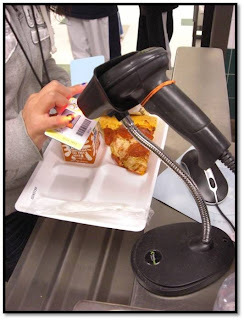 In order to capture photos of every student’s tray quickly and efficiently three mobile digital camera units were stationed outside of each line then positioned by the trash cans in order to capture a second ‘after’ picture before trays were thrown away. Before and after tray images. Each Styrofoam tray used during the designated photography lunch period had a number sticker placed in the upper left hand corner. The numbers coded the tray with the date and school at which it was taken along with a distinct identifying number. After each photo session (there were three at each school), before and after photos were matched together using these numbers. At the end of the plate waste study we had a total of 1,414 pairs of photos to analyze. All of these photos are available for public use on the University of North Texas Digital Library. In addition to the tray photos taken the project Principal Investigator (PI) also took a number of photos of the serving lines. Analyzing the tray photos and looking over the photos of the serving lines taken by the PI brought to my attention a number of themes and details related to the school lunch experience I had not previously noticed. The surprising recognition of these additional observations and data impressed upon me the particular advantage of using photography in research to gain a more detailed and holistic view of an environment. During the period of observation a number of themes emerged from the field notes taken, yet despite the presence of multiple research assistants conducting 30-40 hours of observation the photos allowed me to make a number of additional observations. 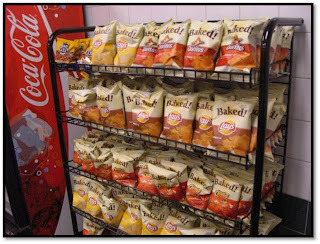 One of these previously unidentified aspects of the cafeteria environments is the fast food nature and message of disposability communicated to students through the ways that food items were displayed and served. Starting with the Styrofoam tray and the multi-purpose plastic spork, paper and plastic wrappers and containers characterized much of the foods that students came into contact with on a daily basis. 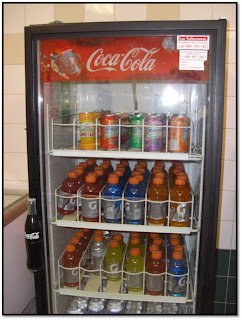 Soda display case at the cafeteria. 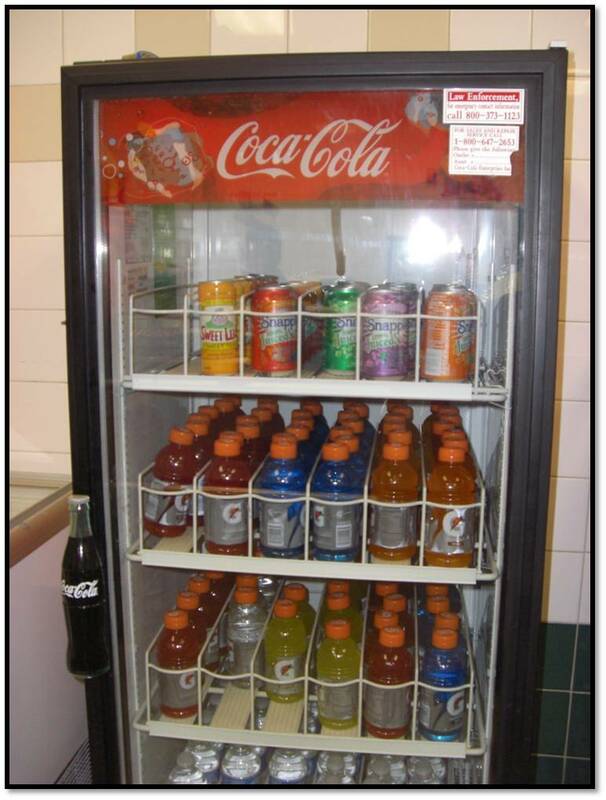 Further, the storing and display of items in coolers bearing name brand soda labels and on food racks typically found in convenience stores also sent the message of convenience. 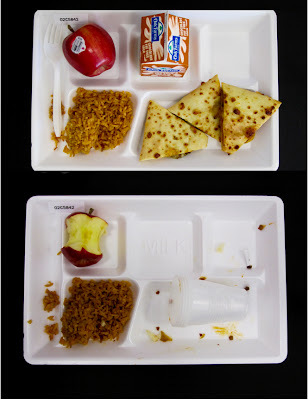 Seeing the combined images of the foods that students most often put on their trays, what they actually ate, and the environment in which their food and consumption choices were being made has me asking questions about how these three aspects might be interacting and influencing one another. Two main questions that need to be asked about this fast and convenient approach to school lunch service are: how this approach to food service influences the choices that students make and what are the long-term ramifications for shaping students’ future relationships with food? In addition to helping me see things I was unable to observe just by being there, photography provided a space for unsolicited voices to emerge and be heard. Often many of the after tray images were not useable as they had been rendered unrecognizable by students. I recall observing such an act of creative destruction and self-expression. On this day I had just positioned my camera unit near the trash cans and was waiting for the lunchroom attendants to begin dismissing students to throw away their trays so that we could begin snapping the after pictures. While I was waiting, I caught sight of a group of three or four boys seated at table nearby. I observed the boys out of the corner of my eye as the earnestly tried to shove all of their leftover items, including the Styrofoam tray, into their empty milk carton. As I nonchalantly watched the boys' efforts they would every so often glance to see if I had noticed. At one point I caught the main boy's eye and he froze expecting, I assume, to be in trouble. I smiled reassuringly at the boy and complimented him and his friends on their success at fitting all the items in the milk carton, all three boys smiled proudly. 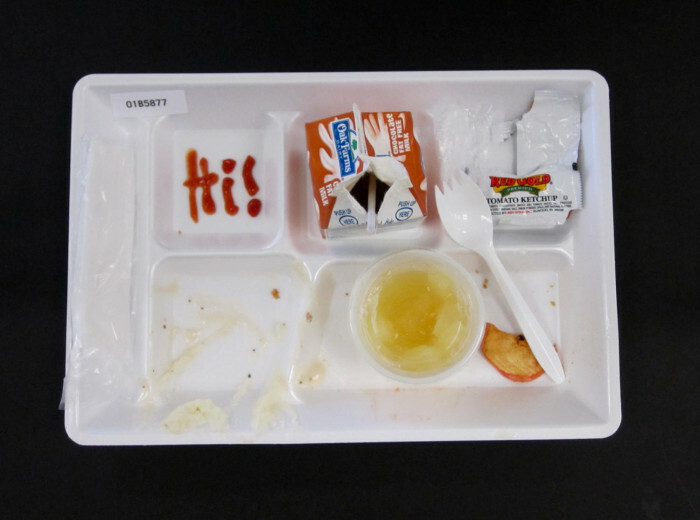 While the vast majority of trays photographed were undamaged, there were those trays that had been ripped apart, or the leftover food had been mixed together and drowned in chocolate milk. I came across a tray or two where students had written a message on the tray either in pen or even ketchup, these messages included the short but sweet “Hi!,” song lyrics, and even an obscenity or two. Perhaps the manipulation of their trays is just to be expected as deviant adolescent behavior, expressions of creativity, or merely the result of boredom. However, I wonder if these messages instead were the attempt of the voiceless to have their say. Were these students expressing what they felt about strangers entering and disrupting their world uninvited? It is possible that both explanations are correct, but once again the pictures told me a story I might otherwise have missed. The story these photographs told was one of recognition, through these few examples of individual self-expression I realized how entirely our project had excluded the input and voices of an entire population. Through the use of photography I learned a number of important lessons about conducting research and being an anthropologist. By taking photographs researchers are able to really capture a whole picture allowing them the opportunity to revisit their field site and research long after they have left it. Through the use of photography we are able to approach our research again and again with fresh eyes and discover nuances that might otherwise have been missed. Additonally, photography can provide a space for the unsolicited voice to be heard. A common practice in visual anthropology is to give subjects a camera and allow them to capture their world as they see it. Photo voice, as this research method is often called, allows the research subject to guide and direct the research process and outcome and thereby equalizing the power dyanmic between subject and researcher. In our project we failed to provide a formal space for the student voices to be heard however some of these did come through in the photographs. Finally, I have learned the impact that images can have in the communication of research finidngs. The images associated with this project have made considerable impacts on the auidences that have received them and have done more to transmit our research than our words ever could.